Sling davit system for carrying inflatable boats, dinghies, kayaks, canoes on yachts. 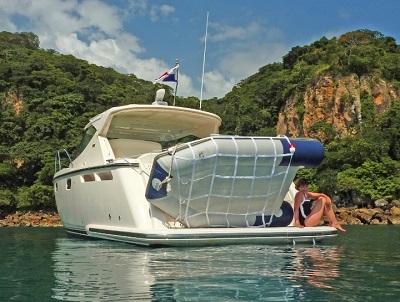 Review these inflatable boat and dinghy sling davits for storing inflatable boats, dinghies, rubber boats, kayaks, canoes and cargo on larger boats, sailboats and yachts. The sling davit and cargo net supports and stores an inflatable boat or hard shell dinghy off the side, stern or swim platform of sailboats, yachts and larger boats. Often inflatable boats are stored using this sling davit system. Review the davit options below or email us with your boat info and we'll suggest the best davit system for you. Free shipping in North America. See happy customer stories below.